Home»Blog»Backup News»We are celebrating 3 million downloads of BackWPup! Last week, we broke the whopping number of 3 million downloads! Until June 20th 2016, you can get our Premium version, with all the additional features and one year premium support, for 30% less! Get it now, until the offer is valid! You can check out all the advantages of BackWPup Premium here! There is quite a lot of time gone by since Daniel, our hard working main developer, started the development of BackWPup, more precisely in the year 2010. And since then a lot more was going on in the WordPress scene, to date 16 other WordPress releases that BackWPup always went along quickly to meet the latest developments of WordPress. WordPress BackWPup, also in terms of functionality , reliability, performance , etc., has grown up. We thank especially our large group of users, according WordPress statistics over 400,000 active users who have remained loyal to us over the years! 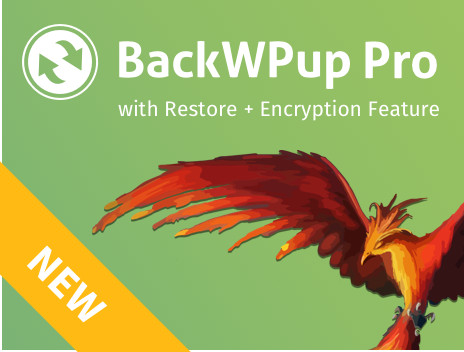 Coming next, we are adding a user-friendly restore function into the Premium WordPress BackWPup Plugin. It will be released in beta and can be tested soon. To improve the restore function before the release even further, we would appreciate if you could participate in our survey concerning the restore function! With a little luck you can also win a premium license! We can’t wait to reach the next milestone together with you!